As we celebrate Poet's Day today (21 August 2017) I thought it’s time to pick up my pen and write what’s in my heart today and let my words keep flowing like a river. Writing that reflects one's inward state of mind. I would like to pen down a short piece on this song, Pal Pal Dil Ke Pass from the 1973 movie Blackmail. A lovely romantic number casted on Dharmendra and Rakhee which still continues to soothe the ears of the music lovers. Voice of Kishore Kumar and his valley of emotions resonates straight from the heart. Film maker Vijay Anand (Goldie Anand) was contemplating on his next project it was producer Vinod Doshi who felt it would be apt for Goldie to take up this new project as its director. Goldie was the leading director those days and Dharmendra was equally keen to work with Goldie the director of repute. Around the 70’s Dharmendra and Rakhee as a pair had worked together and became popular in the movie Jeevan Mrityu. Looking at their good work and growing popularity amongst the masses Goldie decided to have the same couple in his new project Blackmail. Now that the cast was fixed Goldie decided to work on the song aspect in this film. Music composition in Blackmail was done by Kalyanji-Anandji. Rajendra Krishnan the richest writer in Hindi Cinema was the lyrics writer chosen to be part of this project. He was considered the richest writer reason being he had won a jackpot worth 4,600,000 rupees in horse racing which was indeed a huge amount then in the 70’s. Having done all this Goldie now wanted one romantic song to be part of the project. He was already clear in his mind that he would shoot this song in the Queen of Hill Station namely Ooty. Independent luxury cottages peace and quiet and away from the hustle and bustle of the city. Goldie had this situation in mind which he had told the lyricist and music director. Situation revolves around matters of heart where in the lead male star Dharmendra is unable of express his love to his lady love Rakhee due to his timid nature. How true the words in this song says it all, “Mein soch mein rehta hoon daar daar ke kheta hoon”. To express his love the man keeps writing love letters daily to his lady love. However, his shy nature does not give him the courage to post these letters to his lady love. One day he (Dharmendra) gathers courage takes all these letters and showers in the lap of his lady love (Rakhee). His lady love reads all these letters written to her by her admirer and that’s when the romantic number unfolds with passage of time. The creative direction by Goldie is evident if you see the flow of the letters and eventually the courage gathered by the lover. First letter states, Priya(Dear) Miss Mehta. Second, Priya(Dear) Asha Ji. Third, Priya (Dear) Asha. Fourth, Asha and the fifth one finally says it all, Meri Asha. Goldie wanted these letters to sing the song in the movie Blackmail. How to make the letters sing in the given situation was something even the music directors were not getting the pulse right initially. Many days were spend on composing the tune but nothing seems to be working out in the positive direction. Goldie had planned his dates to shoot this song in Ooty. A night before going to Ooty Goldie sat down with Kalyanji-Anandji. Morning turns into afternoon, afternoon into evening and evening into night but still nothing was seen working positively as expected as far as musical compositions went. It was here Goldie suggested how about these words, “Pal Pal Dil Ke Pass Tum Raheti Ho. Jeevan Mithi Pyas Ye Kheti Ho”. Immediately tune was created revolving around these words. Next day before departure to Ooty Goldie sat down with both Kalyanji-Anandji and lyrics writer Rajendra Krishnan. He told Rajendra Ji clearly that he is not a prolific poet as he is and also conveyed the words, “Pal Pal Dil Ke Pass Tum Raheti Ho” that came across in his mind a night before. Now whether to include it or drop these words is your final choice. Rajendra Ji was speechless but after given thought for a couple of hours came up with the wonderful lyrics for, “Pal Pal Dil Ke Pass Tum Raheti Ho”. Finally the song was ready with the words so was Goldie to depart to Ooty. What was pending was the recording of the song. Goldie being creative and genius person decided to go ahead with his shoot in Ooty for this song. The difference, he told Dharmendra just to lip sync the words as per the requirements of the song. Recording of the song in the studios is something Goldie decided to do it after his arrival from Ooty. Also, Dharmendra being busy and Rakhee being pregnant getting mutual dates wasn’t easy. But the creativity of the director Vijay Anand (Goldie) had the romantic pot finally in place after overcoming all the obstacles. 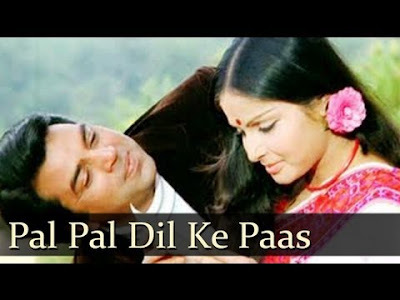 The song, “Pal Pal Dil Ke Pass Tum Raheti Ho” is so popular even today that it’s difficult to believe that the shooting of this song took place first and recording of the song later. Not to forget as I mentioned in the beginning today (21 August 2017) is Poet’s Day. Time to pick up the pen and write what’s in the heart today and let the words keep flowing like a river. Happy Poet’s Day . . . Thank you for sharing your thoughts, and the back stories.